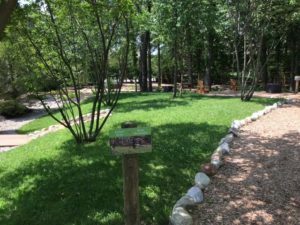 Our school has always had an interesting nature trail and a large, open grassy field that our students and teachers loved to use. But we wanted a more purposeful place that would serve as an outdoor extension of classroom play. Last December, a gathering of a unique committee took place that included a representative from the City of Carmel, the Purdue Cooperative Extension, and Dow Chemical; a landscaper; a Taking Steps to Healthy Success representative, along with our administrative team and faculty. 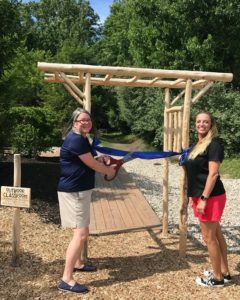 Together we brainstormed ideas on how to make this Outdoor Classroom something special for our students and their families. 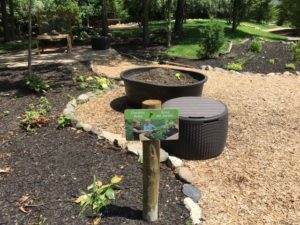 It was so exciting to watch the creation of the new space – from the clearing of the unneeded underbrush; to bringing in truckloads of mulch, stones, and plants; to seeing the new path layout and activity areas – it really made our long winter go by fast. We couldn’t wait to get outside to try it out! 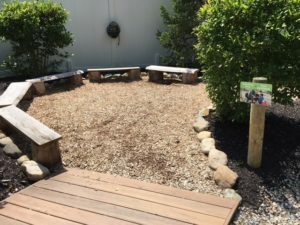 We feel one of the early successes of the new Outdoor Classroom were our thriving garden areas. In addition to a specific Garden Area that includes plenty of soil for dirt digging and soil exploration, we created several raised beds where our students, parents, and teachers planted zucchini, pumpkins, squash, tomatoes and other vegetables. 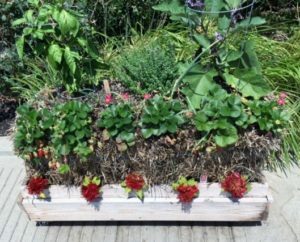 We also successfully experimented with planting herbs, strawberries, eggplant, and flowers in straw bales. We even grew cabbage planters that we put at the entrance of our school! When asked what their students’ favorite thing is about our new space, our infant teachers said their children enjoy looking up at trees and having so many things to look at and touch. The toddler classes love the musical instruments, digging, the balance beam, and the walking path. 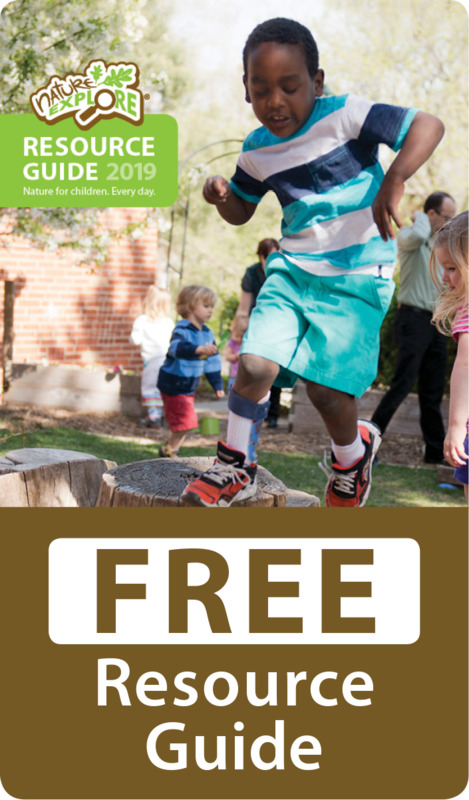 Teachers observed that children with a lot of energy and some challenging behaviors often don’t express those behaviors while in the Outdoor Classroom. Our other classes use the area to explore and be free. Teachers don’t direct children; they make decisions and manage their energy on their own. Everything for them is a sensory experience – they can climb, jump, run and use the materials however they want based on their inventiveness. 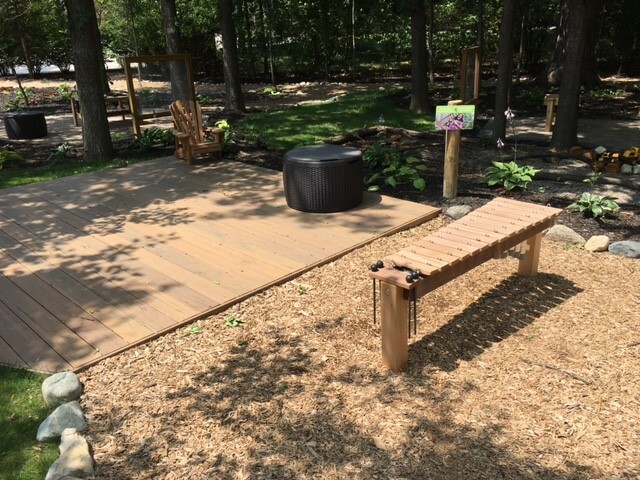 When the children engage in the Outdoor Classroom, their imagination is unlimited as there is so much open space for them to experience and explore. 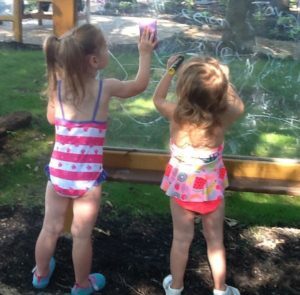 Our Outdoor Classroom is everything we hoped it would be – and so much more. It’s the perfect place for our families to have a chance to reconnect after a long day apart. We are just beginning to see its potential and the impact it will have on our school, and we look forward to taking full advantage of all the memorable learning experiences we know it will present.